Plaintiff's attorney Rick Friedman delivers his opening statement. Click here to see video from the trial. Seattle - A Washington state court jury heard opening statements Monday in the first trial over claims that Johnson & Johnson subsidiary Synthes Inc. used bone cement without FDA approval in the spines of patients who died on the operating table within moments of being injected with the compound. The family of Reba Golden, who died in 2007 at the age of 67 while undergoing a supposedly routine procedure to treat back pain, sued in 2013 accusing Synthes, surgeon Jens Chapman and the University of Washington of knowingly engaging in risky “off-label use” of Norian bone cement despite knowing it wasn’t approved for use in back surgery. The high-stakes case marks the first time a jury has heard arguments about the role Synthes played in marketing its Norian bone cement for use in spine surgeries, which a company doctor said amounted to “human experimentation.” In 2009 federal prosecutors charged Synthes and four company executives with conducting illegal clinical trials on humans, but a plea deal was struck that sent the executives to prison and slapped Synthes with over $23 million in fines. 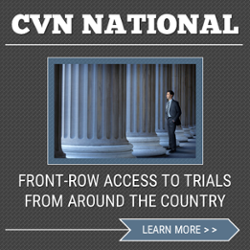 Courtroom View Network is providing a gavel-to-gavel webcast of the trial. Golden’s attorneys have argued that Chapman and former Synthes CEO Jansjoerg Wyss were aware that Norian’s bone cement, originally designed for use in skull and arm bone surgeries, could be deadly if used on the spine due to the increased risk of fatal blood clots. Some tests of Norian cement on pigs during the early 2000’s killed the animals within seconds, but Wyss opted to try the compound on humans instead of engaging in a lengthy, costly regulatory approval process, according to Golden’s lawsuit. “What they did instead is they came up with an action plan that would be faster, cheaper and less safe,” said attorney Rick Friedman of Friedman Rubin, who represents Golden’s family. Synthes has claimed it made clear to physicians that Norian cement lacked FDA approval for use in spinal procedures, and Chapman has maintained that his use of the cement in Golden’s surgery did not fall below the standard of care, according to court filings. Representatives for the parties declined to comment on the case. During his opening statement Friedman explained to jurors how Synthes acquired Norian in 1999 and saw an immediate business opportunity in expanding the use of its cement - which is used to strengthen bones that have been injured - into more types of operations. According to Friedman, Wyss thought a bone cement that could treat common back ailments like vertebral compression fractures would be worth $500 million. However Norian’s cement was not approved by the FDA for use in the spine, so Synthes drew up plans to conduct a “test market” of the product in back surgeries even over the strong protests of some company doctors. Wyss hoped doctors would publish articles after successful procedures that could help expedite the approval process, according to Friedman. In 2004 the FDA began investigating Synthes after at least three patients injected with Norian cement during spine surgery died and others had to be given emergency resuscitation. In 2007 the company was ordered to add a label to Norian’s packaging that explicitly stated it was not approved for use in spine surgery. Golden’s surgery took place after that warning came out, but Friedman explained that the FDA can only control how medical devices are marketed and not how doctors actually treat patients. “They can’t stop a doctor from taking stuff out of a lava lamp and injecting it into your heart,” he said. Chapman’s attorney Michael Madden of Bennett Bigelow & Leedom told jurors that despite Golden’s death his client used the Norian cement in a medically acceptable way. Madden claimed Chapman had actually attempted to bring concerns about the cement to the FDA’s attention, but noted that his own results with the compound in 28 prior succesful operations seemed more promising. "Dr. Chapman was one of the people who was up front in telling the FDA what the concerns were but differentiating what he was doing because his track record experience was completely different,” Madden argued. Synthes attorney James Smith of Blank Rome LLP told the jury that Golden died due to bone fragments entering her lungs after being chipped off by screws inserted to position her during the operation. He argued that by the time of Golden’s operation, Synthes had already taken all reasonable steps possible to inform physicians that Norian cement was not approved for spinal use. “The evidence will show ladies and gentleman that my clients were out of the vertebral compression fracture business, period,” Smith said during his opening statement. J&J acquired Synthes for $19.7 billion in 2012 and incorporated it into its DePuy medical device unit. The trial before Judge Jim Rogers could take up to eight weeks to complete and is being webcast gavel-to-gavel by CVN. The case is Cynthia Wilson, et al. v. Jens Chapman, et al., case number 13-2-29535-1 in King County Superior Court.